The National Flower of Barbados is the Pride of Barbados (Dwarf Poinciana or Flower Fence). The Pride of Barbados blooms all year round, the more common varieties are a fiery Red and Yellow (sunset colour) although other variations can be found. Good friends and family send flowers for Birthdays, Christmas, and other significant events in a person’s life. The flower arrangement need not be expensive but subtle. If invited to a Barbadian’s home, bring fruits, flowers or a bottle of wine for the hosts. There are no restrictions on what kind of wrapping paper is used. Remember gifts are generally opened immediately when received. Send flowers same day to Barbados using our local florists & flower shops. Order by 12 noon. Send Mother's Day Pink Roses, Lilies, Carnations & Special Gifts to Barbados. Send Roses, Carnations, Lilies throughout Barbados for occasions like Birthdays, Anniversaries, Funerals, etc. Enjoy affordable flower delivery across Bridgetown, Speightstown & nationwide delivery. How do i send International Flower Delivery to Barbados? 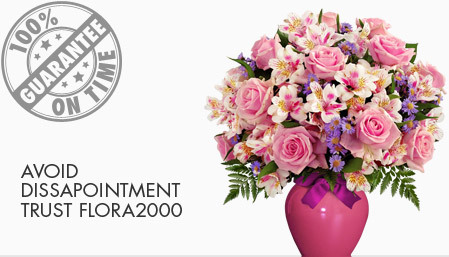 Flora2000 has transformed International flower delivery to Barbados into a fine and effortless art. With our efficient flowers & gifs delivery services worldwide; you are sure to find the perfect expression of your message to your loved ones. Be it Roses, Lilies, Carnations or Cakes, our gifts are sure to make both the sender and the receiver happy. We make sure the gifts you give reflects what you feel about the receiver. Handpicked Unique Gift Ideas for Mom. Fresh Roses, Lilies, Carnation & Gift Hampers specially crafted for your mum. Order NOW for guaranteed delivery on Mother’s day in Barbados.